Since taking over LAB’s site on Old Compton Street two years ago, Swift has won a host of awards and become known as one of London’s top bars. This month, Swift’s menu gets a major overhaul, and given that it is minus two degrees and snowy outside, today seems a good day to share some of the new menu’s beautiful, bright imagery. 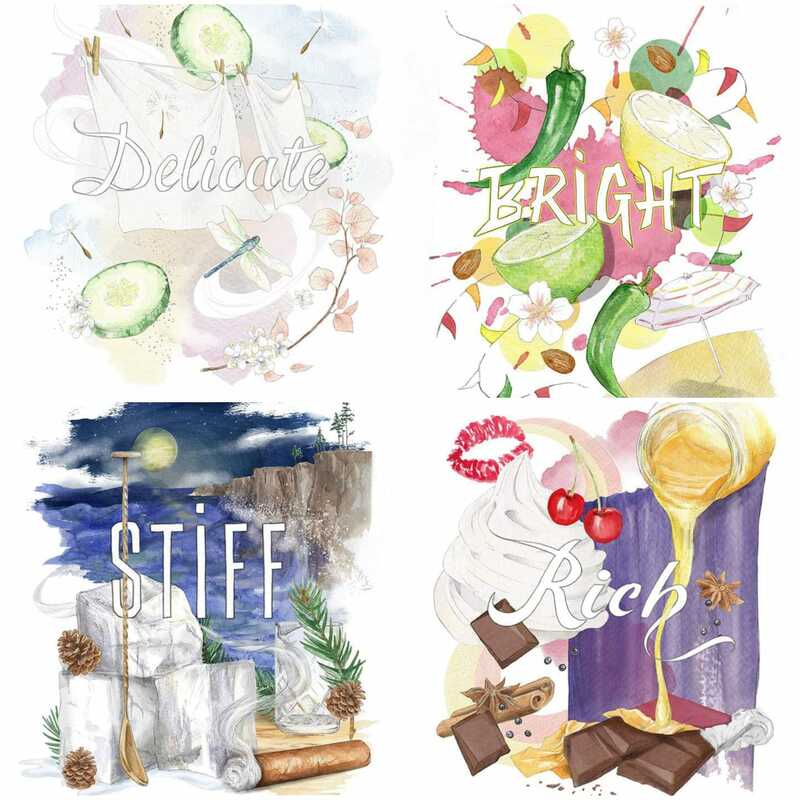 Swift’s new menu is split into four sections, titled ‘Bright, Delicate, Stiff, and Rich’. Drink creation was led by co-owners Mia Johansson and Bobby Hiddleston, with input from the rest of the team, while artwork for the design was created by illustrator Sara Stode. Delicate – Hedgerow: Combining liqueurs and fortified wine for a dry, fruity cocktail with forest notes, it combines 30&40 calvados eau-de-vie, blackberry, Tio Pepe, bay, and still cider. Bright – Carmen: Long and fruity with an earthy note, this cocktail mixes Ginseng Havana 3 rum with kumquat, lime and Chambord compote. Stiff – Jackdaw: A complex, woody and robust stirred down drink which combines a mix of Woodford Reserve Bourbon, Clos Martin armagnac, Swift Jamaican rum, honey and allspice for a well-rounded and balanced drink. Rich – Domino: Vibrant, buttery and with rich notes of cacao this cocktail combines Green Spot Irish whiskey, macadamia, liquroice root, lemon and egg white. A refreshed food offering compliments the new drinks menu, with bocadillo-style sandwiches made with fresh, seasonal ingredients every day, along with classic oysters. Photos: Jason Bailey. Illustration: Sara Stode.